Godey Ladies magazine of 1855 stated “for all important occasions including especially a wedding, as it is not a mark of high breeding to haphazardly bundle and tie flowers together without meaning and careful design”. How we would be admonished for some of the bouquets carried since. They may not all be ‘haphazardly” but they sure are not of the detailed design of tradition. It was said that a good Victorian bouquet like a drawing room…must be crowded and set in style. There are many thoughts to consider when choosing wedding flowers. The season, source, design, and color are all paramount but the traditional meanings should be infused and play a deciding role. Floriography is the art of understanding and appreciation of flowers through the Language of Flowers. The Bride and her bouquet are the centerpieces of the ceremony, and the Language of Flowers returns the beauty and tradition of a real wedding no matter the setting. Historically, flower crowns, bouquets for themselves, the ceremony, and reception were always created with a higher meaning beyond just the visual. Word poseys, nosegays with a message, tussie mussies; all terms for bouquets of flowers specifically arranged with varieties of a tree, vine, herb, spice, fruit, vegetable, and grain added. The Turkish Language of Objects or Selam, further contributes everything from copper coin to feather to pearl; and the Language of Color for completing the meaning. >No matter the bouquet, always include a sprig of rosemary-for remembrance. >Incorporate country & state birth cultures. A Southern Bride must always include a magnolia leaf. >Specify the # of knots for the ribbon streamers from 2-10 for everlasting love and 12 for heart to heart…. 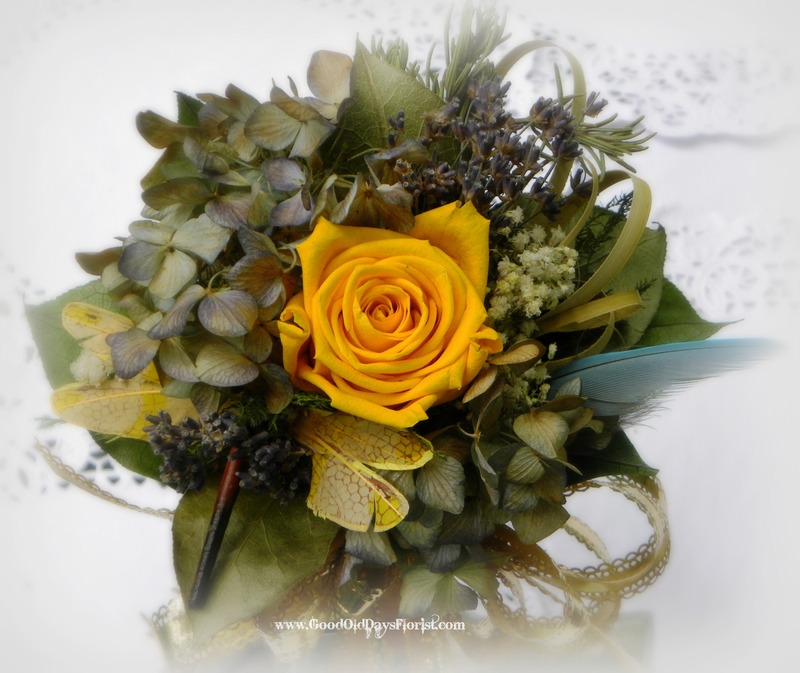 >Design an attendant’s bouquet with meaning to reflect each of their personas-include a tag. And the list goes on and on…..just ask. Fresh, dried, and preserved flowers have always been essential to a fashionable appearance and meaningful for all participants, aspects of ceremony, and the after affair. Start with how you feel along with the hopes, wishes, memories , customs, hobby, or nuances you both may have; continue with the season of availability then the color, and finally the design. Love is all you need for choosing your flowers-start there with all things. Bring your list and thoughts to me and I will create a custom bouquet that will mean more than you ever knew it could. Call 845-562-2820 today to schedule your own language consultation-no matter the occasion.